It has been over 750 years since the City of Delft was granted city rights. The name Delft comes from the Dutch word meaning delve or digging. 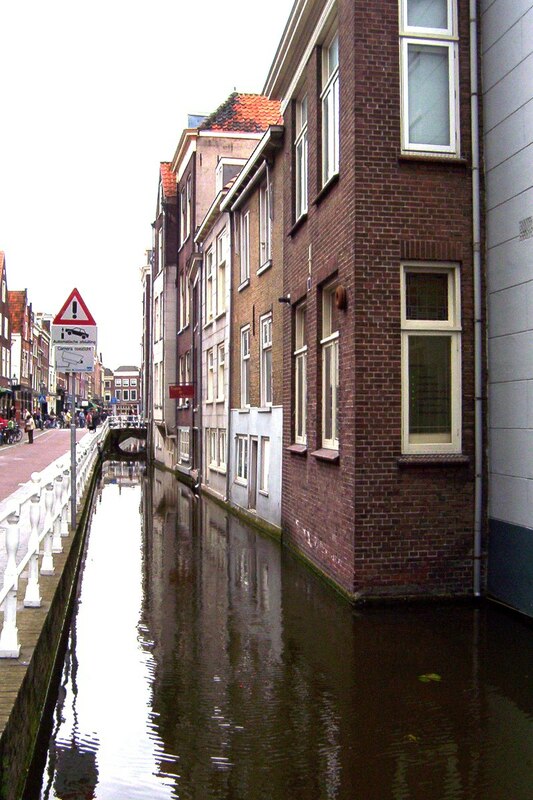 As we soon learned first hand Delft is still surrounded by canals. Throughout its history, Delft has been at the centre of Holland’s art and sciences. This composition, titled, “View of Delft”, was painted in the 17th century by Jan Vermeer. 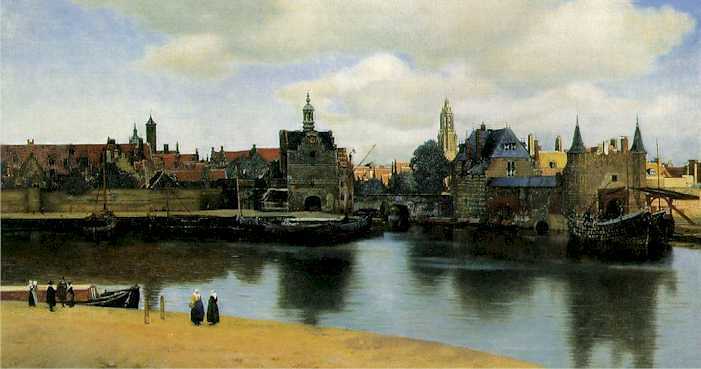 Vermeer was born in Delft in 1632, and although the defensive walls seen in his painting no longer exist, the canals and the Oostport (East Gate) entrance (in the centre of this painting) remain. As Bob and I made our way across the canal, a bridge in the distance lifted up for an approaching ship. 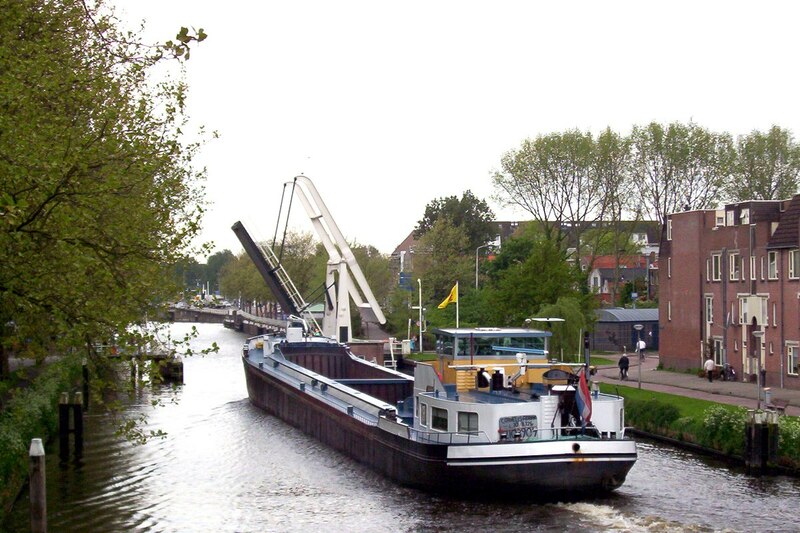 Just as in Vermeer’s times, ships still ply the waters of Delft’s canals. 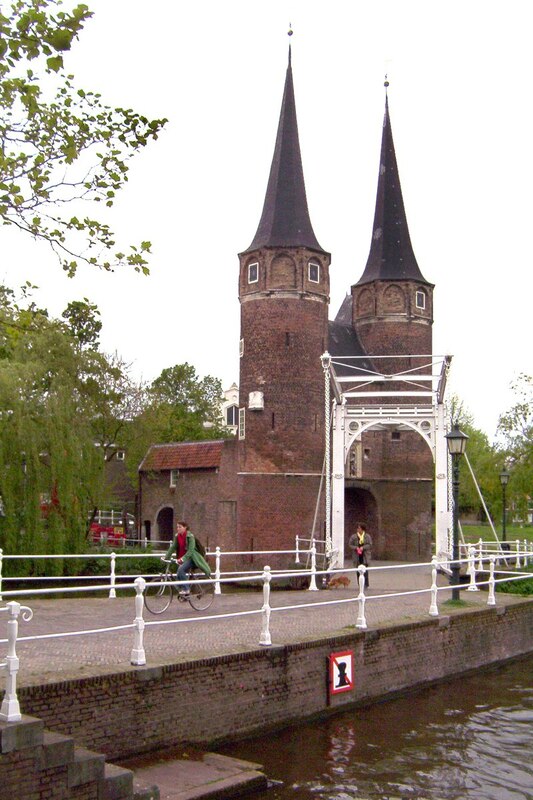 Having arrived by car, Bob and I decided to park outside the old quarter, walk across the canal bridge and enter Delft’s old quarter through its Oostpoort (Eastern Gate) entrance. This is the gate featured in Vermeer’s painting (seen above). The structure of the gate is quite substantial. 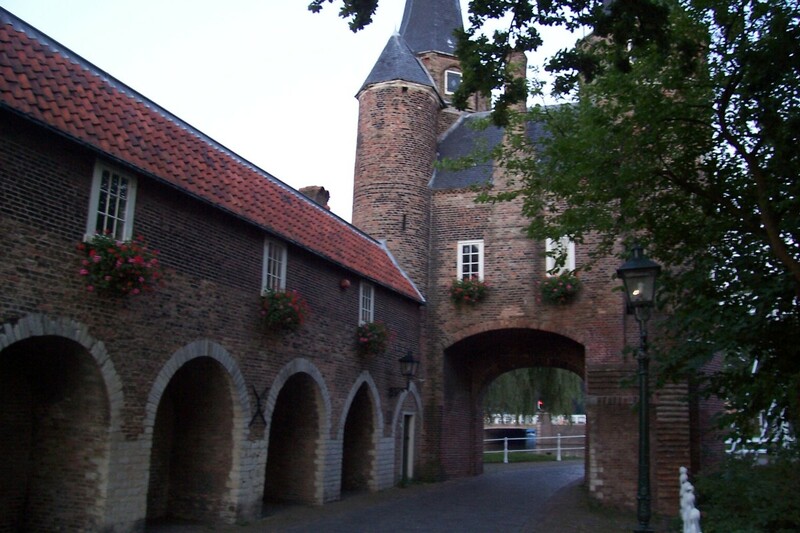 Starting way back in the 1700’s, the destruction began of the defensive walls and other gates that once protected Delft. Eventually, all were demolished except for this one gate. Fortunately, a decision had been made to save it. 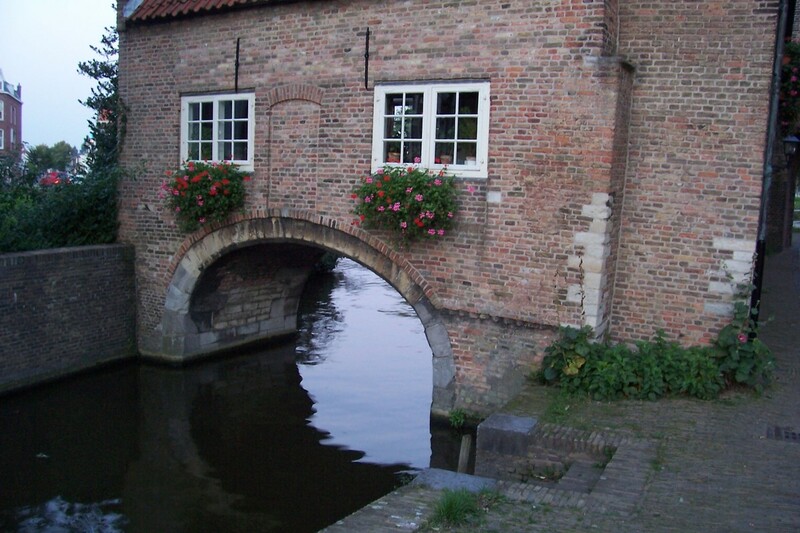 Along with the towers and drawbridge at the entrance, the structure also includes this little house above the canal. 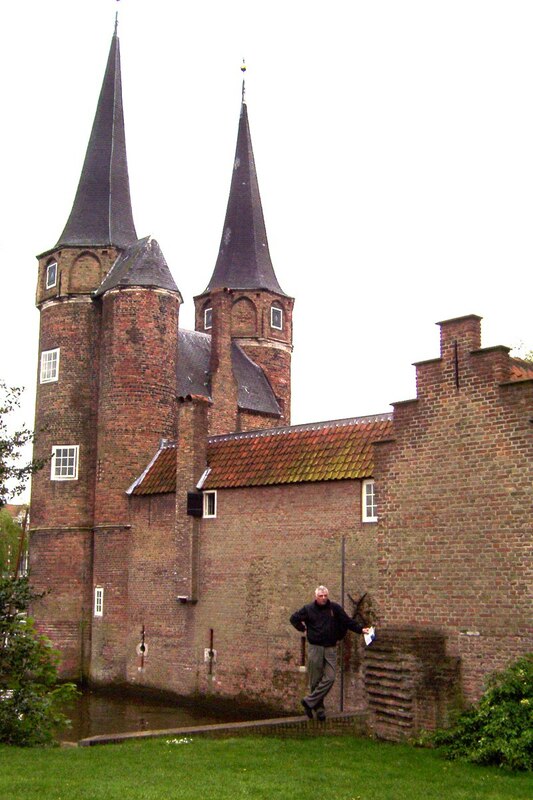 This Oostpoort (East Gate) dwelling is now inhabited by a local family, and has been in constant use since the early days of its origins. Bob decided to have a closer look at the Oostpoort (East Gate) home’s brickwork. Behind him, two towers reach for the sky. 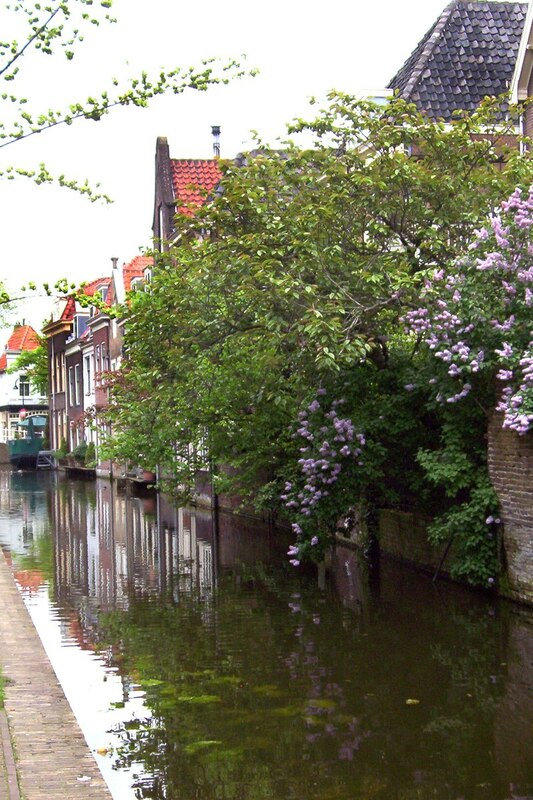 Delft is a very scenic city, and the myriad vistas we encountered on our walking tour included endless interconnecting canals, bridges, heritage buildings and sprawling vines all abloom. The still waters of the canals created stunning reflections of the architecture. 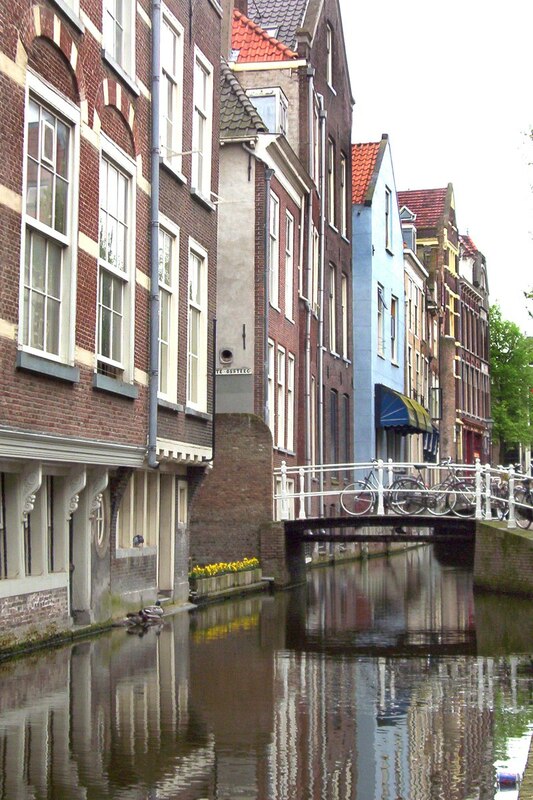 Delft has always been at the centre of Holland’s artistic and cultural world. The city is located only a few miles from the The Hague, and so for hundreds of years, these homes have been inhabited by some of the most important people in the country. During the time of the Dutch East India Company, the company’s head office was situated in Delft, and so, with huge profits in hand, the wealthy Delft merchants and traders eagerly supported the arts, culture, and Delft pottery production. 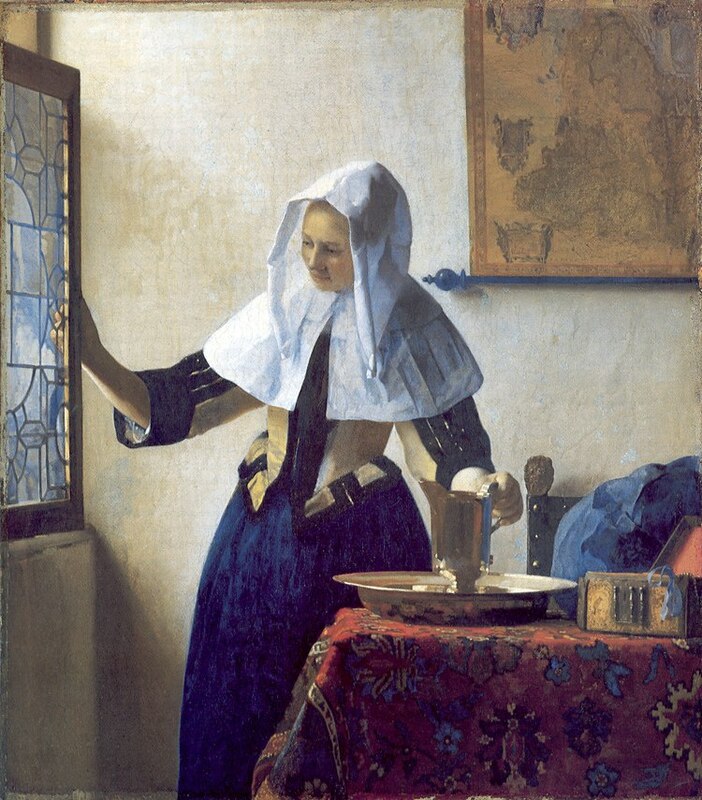 Along with painting “View of Delft”, Jan Vermeer also painted this work titled, “Woman with a Water Jug”. Vermeer painted 34 other paintings in his short lifetime; he died at age 43. During his life, Johan (Johannes, Jan) would spend several months working on just one painting. Today, if you want to see Vermeer’s work, you need go to New York City. 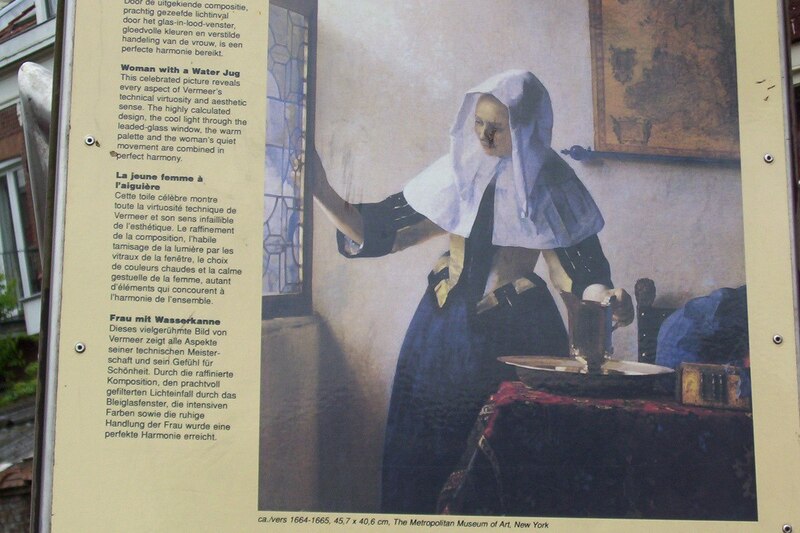 There, you will find nearly 20 Vermeer paintings, 15 at the Metropolitan Museum of Art, and 3 at The Frick Collection. 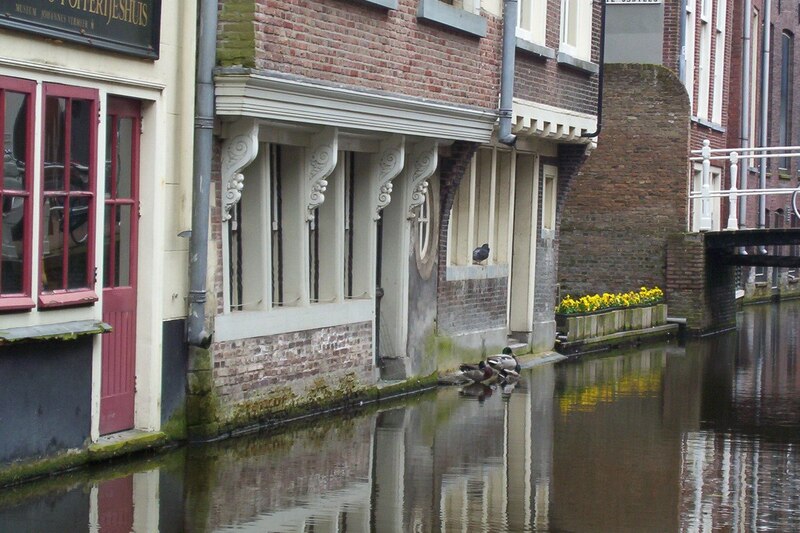 Ironically, in Delft we were only able to see a “Woman with a Water Jug” on a street sign. The original is on exhibit in New York. One small shop that Bob and I entered into encompassed all that one thinks of in terms of Delftware. 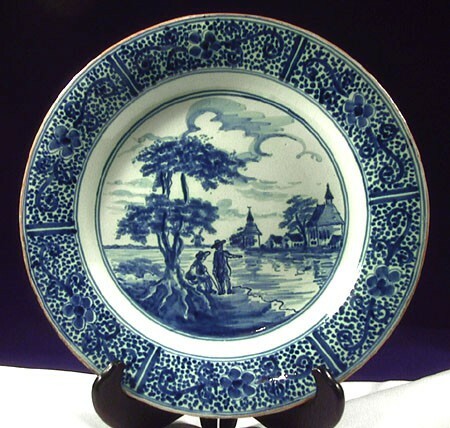 Of course, Delftware is synonymous with Delft and is the brilliant blue ceramic pottery that has made this city famous. 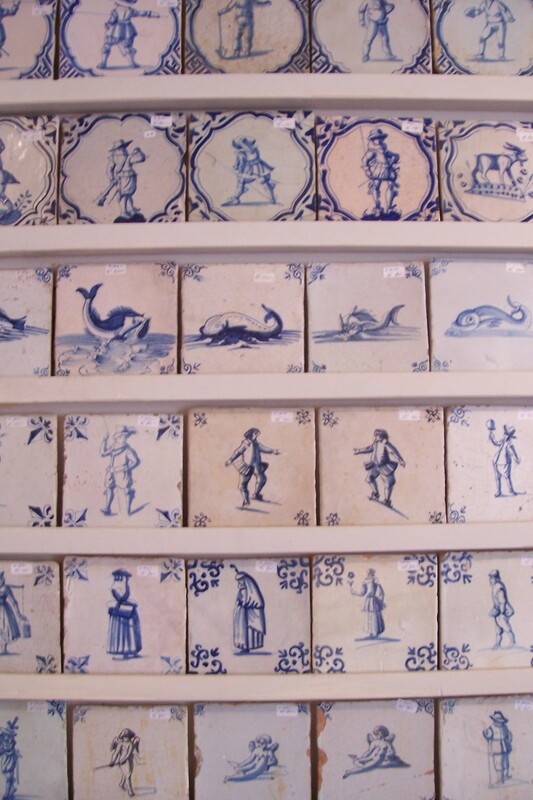 In this shop, the walls were lined with antique Delft Blue tiles sporting depictions of things like whales, flowers, people and birds. 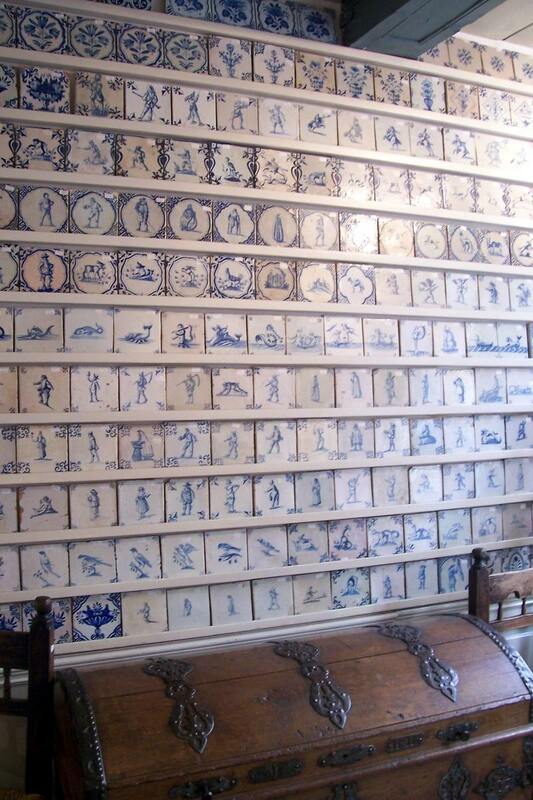 Each of these antique Delft Blue tiles was hand-painted in the time of Vermeer, and was used as a decorative panel. As we would see in some of the homes we visited, many people still proudly employ these tiles for wall decoration or flooring. At the peak of their popularity, the demand was so great that Delft potters turned out close to 800 million tiles over 200 years, starting in the 1500’s! A selection of Delftware Pictorial plates also was available in the shop, many of them featuring Dutch scenes of the day. As Canadians, both Bob and I love to skate. In my case, it might be because one of my great-great grandmothers came from Holland. As such, we were on the hunt, not just for Delftware, but for a pair of antique Dutch wooden ice skates. 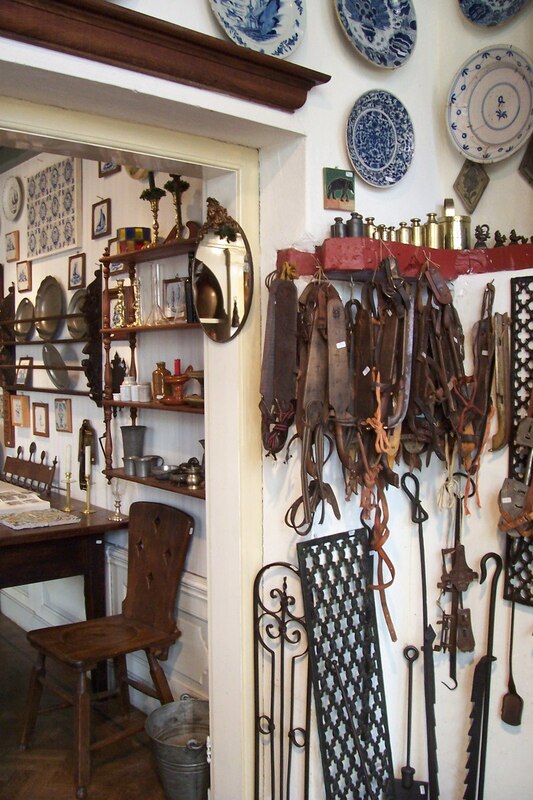 We were pleased to find this well-stocked antique shop where a good number of old wooden skates hung on the wall. Definitely, skating and Holland fit together like two peas in a pod given all the canals that turn to frozen conduits in the winter. That fit started back in the 14th century when the Dutch began making wooden platform skates like those seen here. You simply strapped them to your shoes. After trying on a few sets, Bob and I finally found a couple of pairs to bring back with us to Canada. Not that we plan on using them. We have our own modern-day versions for that! Delft, like most places in Holland, once had hundreds of windmills, but today, there are only a few left standing. 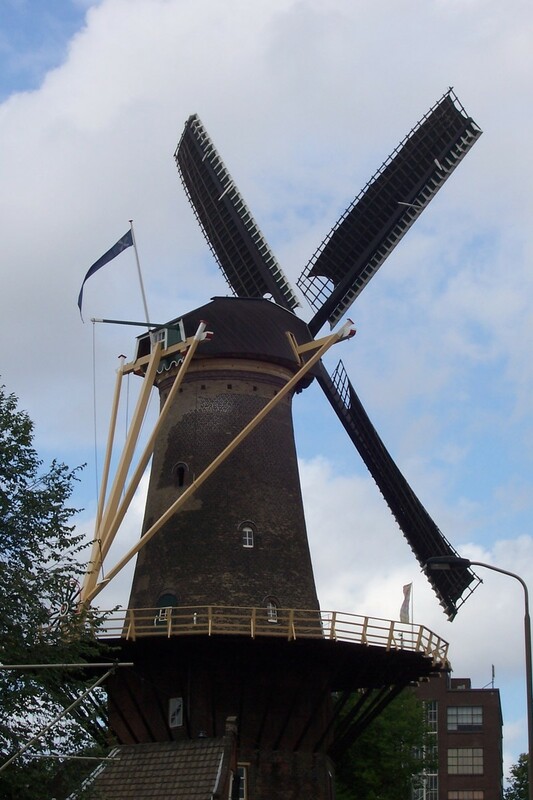 This mill in Delft is called Windmill de Roos (Windmill the Rose), and it was built of stone in 1679. As we learned, however, this is actually the so-called modern version. The original was constructed on this same spot back in the 1300’s, and it consisted solely of wood. In true Dutch fashion, the so-called “modern version” still spins with the wind and turns a profit each day. 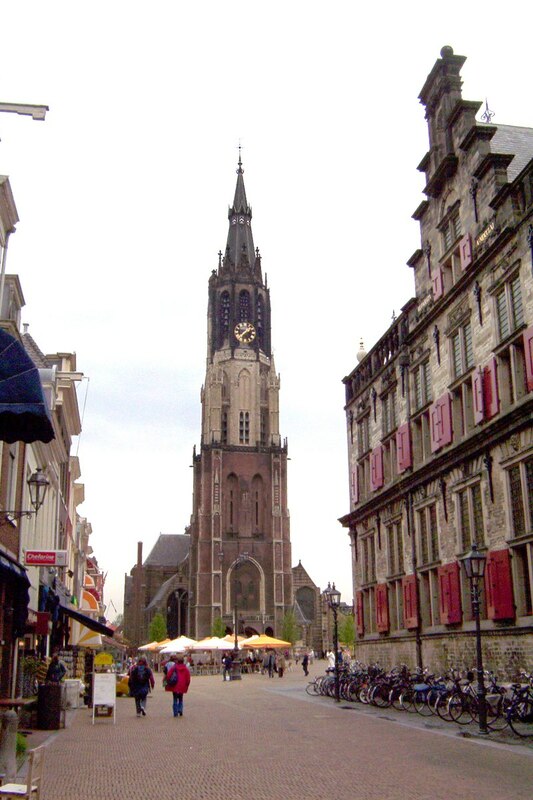 As we approached Delft’s main market square, the soaring steeple of the Nieuwe Kerk (New Church) came into view. Nieuwe Kerk is one of the most important Protestant churches in all of The Netherlands. It is within this church that members of the House of Orange-Nassau are entombed in the royal crypt. The latest members of the Dutch Royal family to be buried there, in 2004, are Queen Juliana and her husband, Prince Bernhard. Talk about painstaking work! 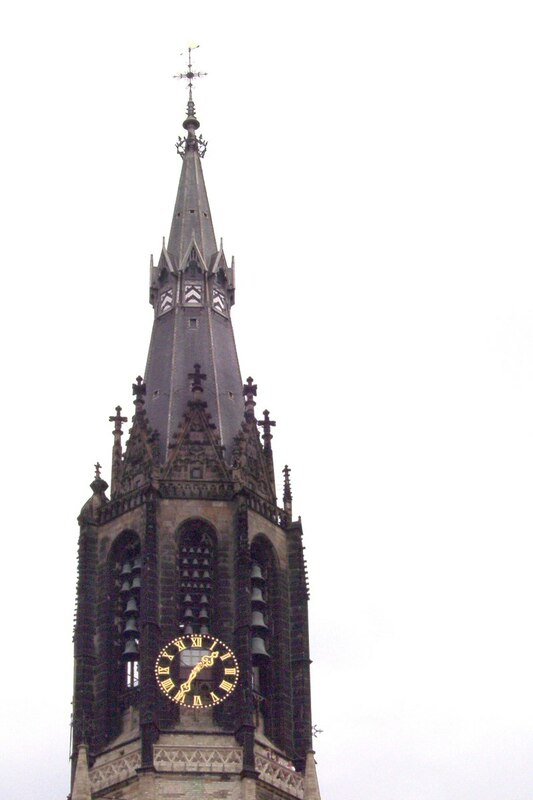 The tower at the top of the Nieuwe Kerk (New Church) took one hundred years to build, from 1396 to 1496. 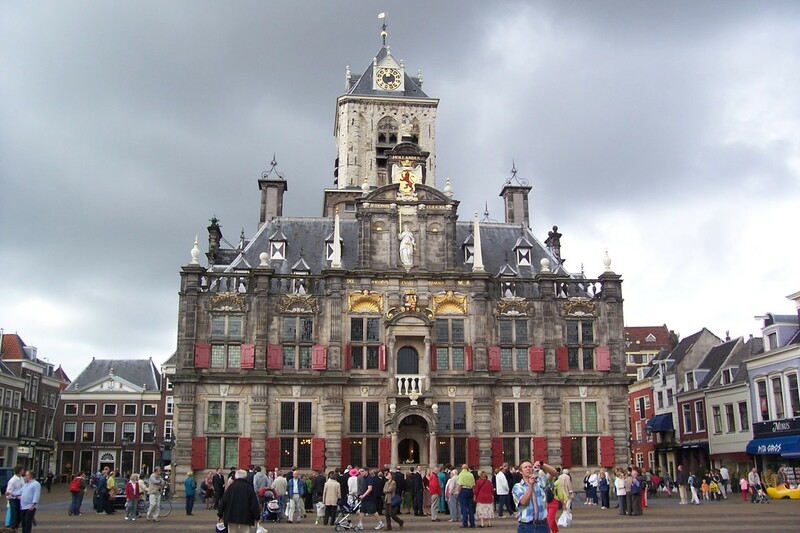 At the opposite end of Delft’s main market square, facing the Nieuwe Kerk, is Delft’s old City Hall. We were lucky with the light, and the rains held off, to get this picture of one of Delft’s most distinctive buildings. Today, like in the past, the old City Hall is used for weddings. Back in the 1600’s, it was to this building that artist Johannes Vermeer came to arrange his marriage to his wife, Catharina Bolnes. Delft was a marvelous city to visit. Comment: Loved this photo essay! 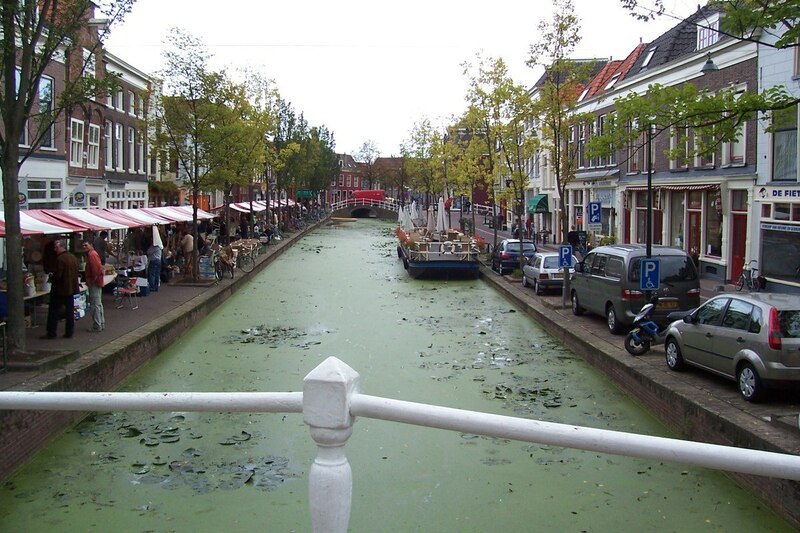 My husband and I visited Delft in 2009 and your pictures really enabled me to revisit one of our favorite little towns! Thanks.